I first heard the Infamous Stringdusters in 2006 at the Joe Val Bluegrass Festival, when they were asked to fill in for bluegrass supergroup The Grascals at the last minute — a lucky break for a sextet of relative unknowns who had yet to release a single recording. But my disappointment at missing The Grascals didn’t last long. The Infamous Stringdusters turned out to be my favorite kind of bluegrass band: young folks with high energy, incredible skill, and a tight yet easy newgrass sound, who lean towards fast-paced songs performed gleefully and well. Since then, I’ve seen the Stringdusters a few times, and played their long-delayed first album Fork in the Road half to death. Songs:Illinois sees it too, calling them “one of the most acclaimed young groups that straddle [the] line between polished bluegrass and down to earth country.” And I’m happy to report that their self-titled sophomore release The Infamous Stringdusters is more than equal to their growing reputation in both the jamband and bluegrass communities. 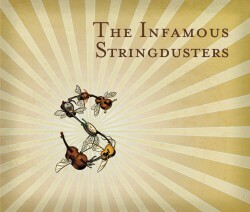 The Infamous Stringdusters features the strong songwriting and instrumental talents of each bandmember on a plethora of catchy bluegrass tunes; as such, it contains no covers. But it merits mention here because it comes with an tantalizing bonus: if you pre-order The Infamous Stringdusters before the June 10th release date, you get exclusive access to an incredible full-length live concert recording, which includes two strong covers. My bias against after-the-fact live recordings is well-known; too many suffer from crowd noise, poor mixing, and muddy sound quality. But the tracks from this April 15th show at the Fox in Boulder, Colorado are exceptionally well-mastered, with a high fidelity that manages to capture the feel of an Infamous Stringdusters performance without sacrificing one bit of the instrumental wizardry and genuine pleasure in play that each artist brings to the stage. The crowd noice is there, but it’s light enough to fade into the background. And that occasional hoot or holler? It’s likely from the band, who are in rare form, and know it. Here’s those two covers from that show, plus a bonus version of Deep Elem Blues from Sound of the Slide Guitar, last year’s solo release from Infamous Stringduster’s guitarist Andy Hall. Pre-order The Infamous Stringdusters from Sugar Hill Records today, and you’ll get the rest of this amazing live show as a bonus; pick up Andy Hall’s Sounds of the Slide Guitar while you’re at it. If you just can’t wait, or you’re still on the fence, head over to Songs:Illinois for an album track to whet your whistle. And just in case you can’t remember who The Stanley Brothers are, here’s today’s bonus coversongs, two familiar takes on tradsong which might serve to jog your memory.